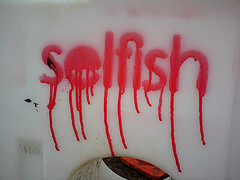 I think being selfish gets are really bad rap. Most people think that being selfish is bad. We are taught we must not be selfish, but instead we must be giving. I personally don’t believe these things are opposite. I believe that every act I make is a selfish act because it is a self-defining act. Let me give you a few ridicules examples to help prove my point. Right now as I type the article I am taking a deep breath in which means I am being selfish. There is no other reason to breath than to stay alive. That is very selfish. When I choose to love my family I am being selfish because I want to be a loving person. This is different than wanting to be seen as a loving person. I believe (and hope this is true) in my heart of hearts I can be and am a loving person. When I choose to love someone (and it is a choice) I am defining myself as a loving person. When I choose to run my practice and help other people I am being selfish because I am choosing how I us my time. Yes I am helping people, and that is a great thing, but I am not healing them. That is their choice. I am just a guide in the process. They are being selfish when they choose to heal. I am being selfish when I choose to articulate who I am as person who guilds people on this path. Yes, I know these examples are extremes, but I think they bring out the point because we think of being selfish in such extreme terms. Not only is it okey to be selfish, it is impossible not to be selfish because every action we make with our conscious choice is a self-defining act. When I work out to get healthier I am being selfish because I could be doing other things with my time. When I study a new skill I am being selfish to make myself a different type of person later. I am being selfish when I take a nap so I can be more present to my clients later this afternoon. It is okay to be selfish. The reason you are still feeling uncomfortable every time you read that is because it is very easy to believe that selfish equals greedy, mean, heartless, and willing to hurt other. Other than this article I willing to bet less than five times in your life have you been told it is okey to be selfish. We need to be selfish. If we don’t take care of ourselves we are never going to be able to take care of others. We need to be selfish. If we don’t take care of ourselves then we aren’t taking care of ourselves. We need to be selfish. If we don’t take care of ourselves we are never going to grow and heal in to who we truly are. I don’t want to be selfish…because I need to care for other people…there are people who have it so much worse than I do…that I can’t ask for anything more or better…and the things I have…I have squandered…it would be really selfish to ask for more…but I choose to know that selfish means I am making self defining act…every choice I make is a selfish act…I can love someone else and be selfish…because I want to be love…I can care for someone else because they are in need and be selfish…because I want to be giving…this doesn’t take anything away from those loving acts…this doesn’t mean they are less valuable…it just mean that when I am share I am also defining myself…it is okey to want better for myself…because I can then share with other…it is okey to want more for myself because then I can share more of the self with others…I am worthy of taking care of myself…that is not greedy…that is being healthy….I need to be healthy…I must be healthy…it is okey that I don’t think being selfish is a bad thing…I don’t want to be mean…I don’t want to be greedy…but those are not the same a selfish…to be selfish is to choose to be the type of self I want to be. great article and so true – I used to help others completely for free and thought that was totally unselfish, until one day someone told me it was one of the MOST selfish thigns i could do! funny how when someone else puts things into perspective like that that you realise how selfish you are often being without even realising? This is a subject that is near and dear to me. One of the reasons people have a problem with being selfish is that they believe in a lack of abundance in the world. I believe in what I call Generous Selfishness. Being selfish is the most generous thing that I can do. How can I give if I don’t take care of me? How can I give if I don’t live in abundance? I can not give what I don’t have. And that is the best thing I can be if I want to be there for someone else.